I just want to show you guys on how to setup your WhatsApp on your computer. It is easy to setup your WhatsApp Web Online. You just need Chrome browser and latest WhatsApp. WhatsApp announcement on WhatsApp Web is a big relief as more user tend to convert to Telegram. This features is a long waited by WhatsApp user. 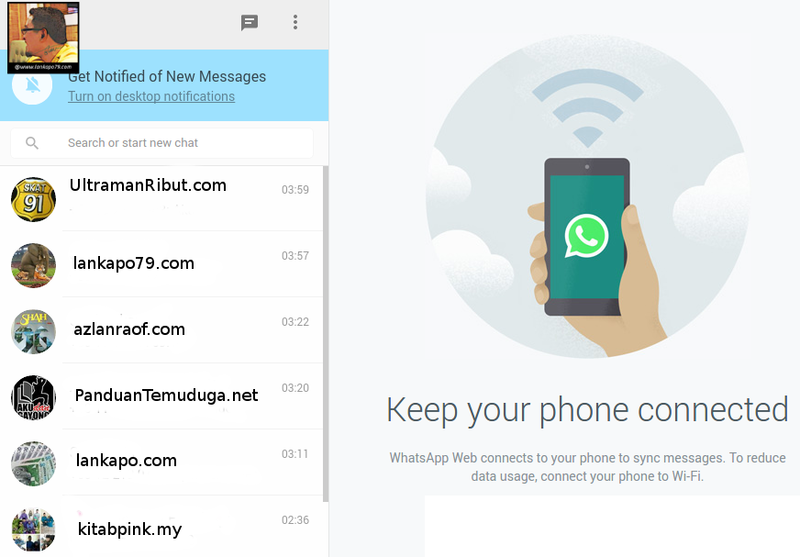 Before this, user have to install Android emulator just to get WhatsApp online on their PC. Which I already did. But it just too slow and always hang. Maybe this features is a little too late compare to other phone messaging app such as Telegram and Wechat. But bare in mind, WhatsApp is the most popular messaging app with its user up to more than half billion active user around the world. So this is a good start. Better late than never. You can type easily, share file, links and picture to all your WhatsApp friends. No more peeking at your hand phone to see message from your friend or group. 1. Make sure you have latest updated WhastApp on your phone. The latest WhatsApp have WhatsApp Web menu when you click on the menu setting. If you dont have this menu, please download and install from Google Play or WhatsApp download page. Make sure you backup all your data and message history before you install latest WhastApp. 2. WhatsApp Web is only support by Google Chrome. So for now Firefox or Opera even Internet Explorer are not supported yet. Maybe soon they will add it. 3. Then go to https://web.whatsapp.com/ on Chrome browser. 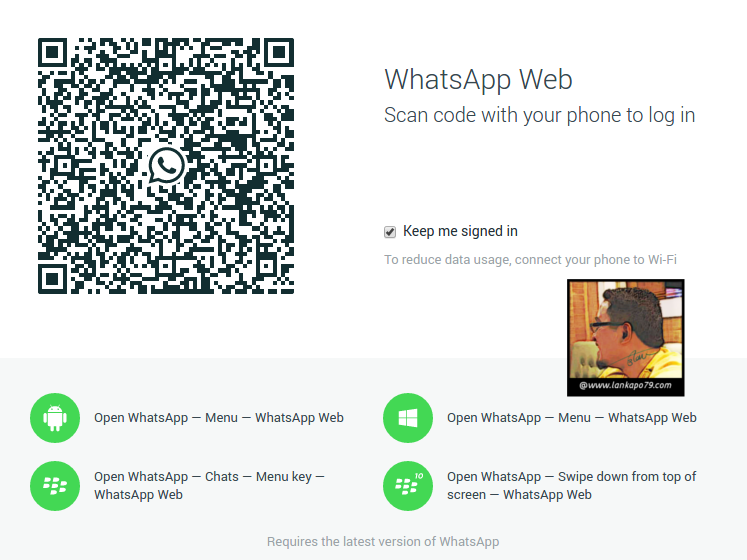 You will see a QR code and instructions on how to open WhatsApp Web menu on your phone. For Android and Window Phone user, you just need to open WhatsApp, click menu and find WhastApp Web menu. For Blackberry , you need to open WhastApp, go to chats, click menu and find WhastApp Web menu. For Blackberry 10 smartphone, Open WhastApp, just swipe down from top of screen and find WhatsApp Web menu. 4. When you click WhatsApp Web menu, scan QR code on your Chrome browser. Make sure you fit the QR code in to your scanner and heard a click sound. This to ensure that you log in. 5. You will see interface like below if you successfully log in to your WhatsApp Web account. You can turn on Desktop notification. You also can see Chat History, Video and Voice message online. You can see Group chat on your left menu. Plus you can share video,image and link from your computer to your whatsapp friend. Awesome! You cannot easily forward picture that you receive. You need to download it first and re upload it back to send to other friend. You cannot directly change profile status and picture online. You need to change it on your phone. Then it will sync online. You also cannot delete or clear chat history. iOS is not supported yet. You should realize that by using WhatsApp online, you can expose your account to potential hackers. Especially if you use your computer at office or in public places and left it. So make sure it is password protected when you left your computer. Make sure after you are done using WhatsApp web, log out from all computers to avoid access from third party. It is very important, because you don’t want your sensitive picture and video falls to the wrong hand. Very useful tip. i tried and its working.. Thanks for sharing.. Now WhatsApp has also voice calling feature activated..